2009: Jan McFarlane, the Archdeacon of Norwich and Director of Communications, has had her first book published and it is proving to be a Christmas best-seller. 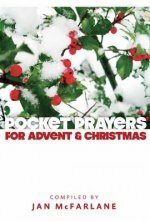 Pocket Prayers for Advent and Christmas is a collection of prayers, old and new, familiar and challenging, taking the reader from Advent Sunday through to Candlemas. The Church Times has named the book at the number one best-seller in religious bookshops so far this Christmas. Jan said: "I'm delighted that the book is selling well. It would indicate that we've acheived the aim of providing something which is both a pocket-sized resource for Christians, and a gift book for those on the edge of the church who, at Advent and Christmas, draw a little nearer. But I don't think I'll be able to retire on the proceeds just yet!" The book, which is published by Church House Publishing, and retails at £5.99 is aimed at people on the edges of the Church, and those who find themselves drawn to the Church at Christmas. The pocket-sized book is deliberately formatted to be carried around and dipped into at spare moments through the day. "I was pleased to be asked to compile this book, " said Jan, "And I agreed to do so on the understanding that it would be finished before beginning my new post as archdeacon in March. "Having agreed, I then remembered that all my books were in storage while my new office was being built, so I had to beg, borrow and steal (well perhaps not steal!) resources from colleagues. I'm really pleased with the attractive cover design and hope that it will make a suitable gift for those with friends who are open to the real message of Christmas."